This is the last of my Brisbane food posts. Overall I really enjoyed all of the food I ate in Brisbane but I have to say the highlight for me were the breakfasts. Brisbane breakfasts have certainly come a long way since I lived there back in the 90's when fancy meant toasted sourdough instead of mighty white! I don't normally get to eat breakfast out much these days, being the parent of a 3 year old we find that the whole process just a bit too hard. It is definitely made even tougher given that getting a table anywhere decent these days can be very difficult. I'm not really a fan of the waiting list especially when I really just want that first coffee to start the day. As I was sans child in Brisbane, the first problem was averted and I very was keen to see what Brisbane had to offer. I'm pretty sure the second problem was also averted due to the fact I wasn't in town on Saturday and Sunday. By all reports Brisbane suffers the same issues as Melbourne when it comes to snagging a table on weekends. My first breakfast was at the Gunshop Cafe in West End. I adore West End, we lived in a lovely little worker's cottage in Paris street back in the day and since then we have always had a soft spot for West End. The Gunshop breakfast menu has heaps of great offerings but as I always like to try something different when I see it, I couldn't go past the Black Pudding, Toasted Brioche, Fried Duck Egg, Rocket, Apple, Prune and Pear Compote. It was superb! The black pudding was sensational, so rich but also such a lovely delicate creamy texture, melt in the mouth deliciousness. 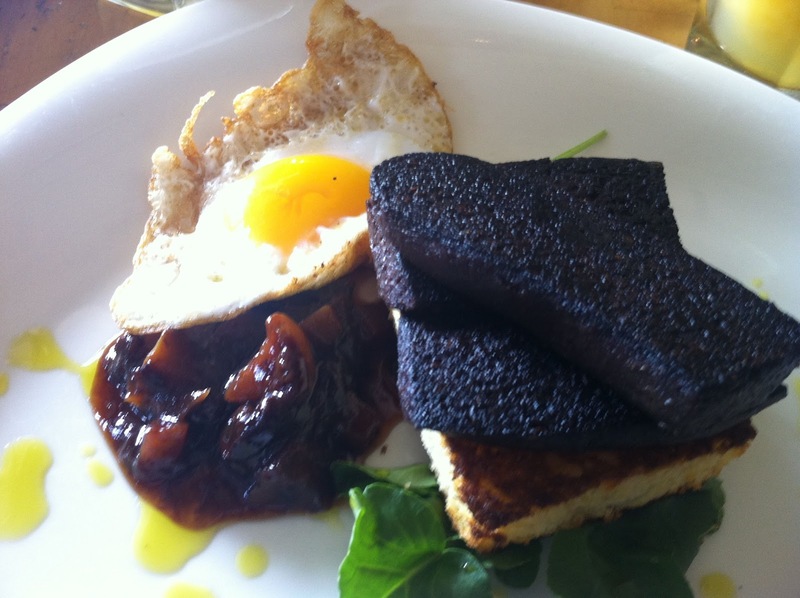 I also really liked the toasted brioche, I'm a sucker for sweet bread and thought it combined perfectly with the richness of the black pudding. When it comes to breakfast I think it's often the sauce or relish that makes a dish stand out and the apple, prune and pear compote was definitely a great exponent of my theory. It was the perfect compliment, both sweet and rich at the same time. This was easily my favourite breakfast in Brisbane and I struggled not to order it again the following day. A few other meals on the Gunshop menu had taken my eye so I returned the next day to continue my research... If there's no black pudding on the menu (which is usually the case) I'll often go for a fish breakfast, maybe because you don't see it that often (expect smoked salmon) but also because its just that bit lighter than the usual protein heavy bacon options. Gunshop had a few fish options available but I settled on the Vodka Cured Ocean Trout, Poached Eggs, Spinach, Rye Toast, Hollandaise. I'm not usually a fan of hollandaise, it's not that I don't like the taste, its just that the food snob in my finds it a bit passe. I am also wary of it because of the many reviews you read about poorly made efforts. That said, I always try to resist the temptation to meddle with the chef's creations, especially when you can obviously tell that a lot of thought has gone into each flavour combination so I resisted the urge to ask for the apple, prune and pear compote instead of the hollandaise. I also thought that it might be a bit overwhelming against the cured trout. 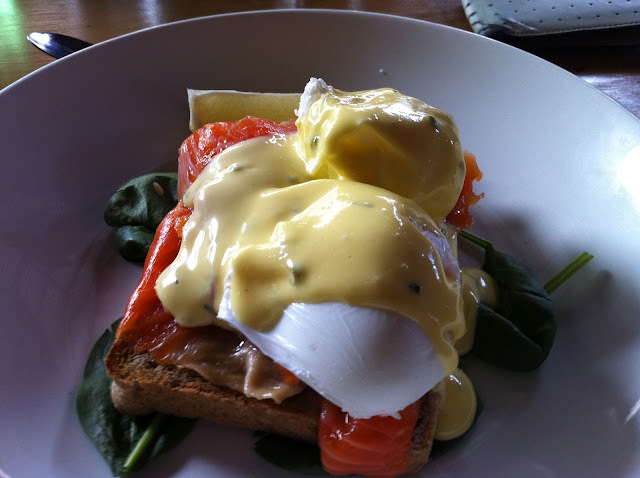 The trout was lovely, I really like cured oily fish, the eggs were perfectly poached (so much better than my sad efforts at home) and the lemon added a nice bit of zestiness to the whole meal. The hollandaise was lovely and creamy and I'd say it fitted with the cured fish but I was left thinking that there was probably a better option than hollandaise for this dish although I couldn't come up with one. My last breakfast was at Anouk in Paddington. Paddington is another favourite Brisbane suburb of mine so I was more than happy to take a short cab ride and check out Anouk. I had read some great reviews and was anticipating awesomeness. I wasn't let down. 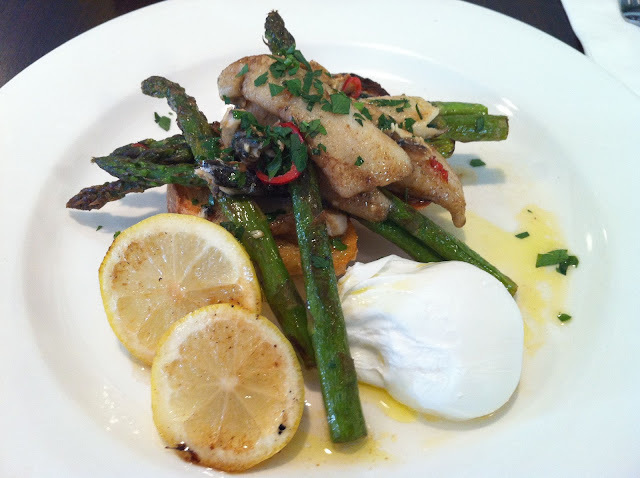 The Anouk menu had lots and lots of great options and choosing was difficult but I finally decided on the Spring Whiting Pan Fried with Asparagus, White Anchovies, Chilli, Garlic and Toast. This turned out to be a great choice, obviously not your standard breakfast but I found it a great meal to start the day. Such a wonderful combination of flavours, subtle fishiness of the whiting, earthiness of the asparagus, with lovely lemon zestiness, salty anchovies and a little punch of chilli. There was something almost Vietnamese about the flavour combinations and of course that hit the bullseye on my sweet spot. I am a huge fan of whiting which harks back to when we used to stay at my grandparents house on Bribie Island and Grandma would cook up fried whiting fillets that Keitho had caught that morning. It was always accompanied by Grandma's super special creamy curry sauce. Its my earliest memory of eating so much that I was actually in serious discomfort afterwards. As I said above I really enjoyed my time in Brisbane but I wouldn't be a true ex Queenslander now living in Melbourne without having a bit of a dig at my old home state so here goes. One thing that I have always found a bit odd is the giant bowls of coffee that some of the cafes sell in Brisbane. I first saw this a few years ago and thought it was quite amusing. Maybe its an American influence, I really have no idea. On this trip to Brisbane my dining companion ordered one of these bowls of coffee and this one seemed even bigger than anything I'd seen previously. 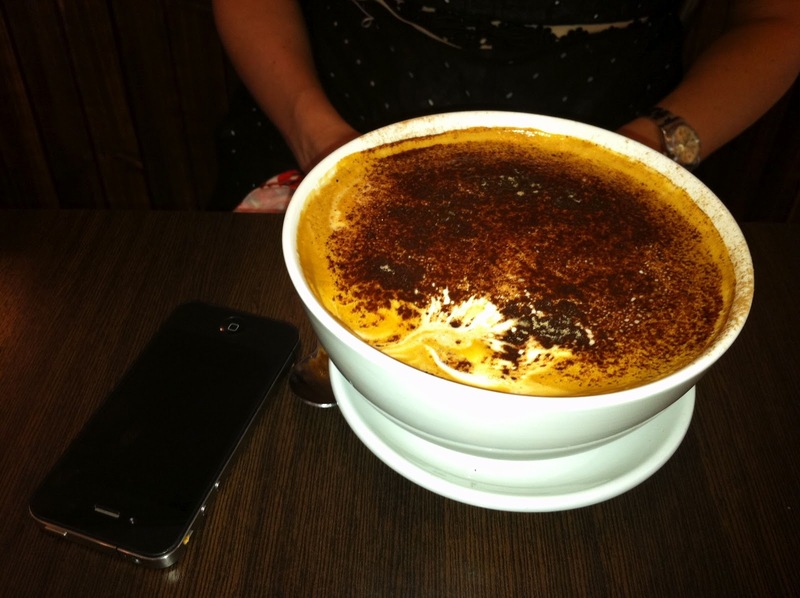 (check out the size comparison with the iPhone) I have to say that all of the coffee I enjoyed in Brisbane was of a high standard which is great but at no point did I feel the need to slurp up a giant bowl of it. I mean, where will it end? At the current rate of growth you will soon be able to get a cappuccino served in a goldfish bowl!